Especially during busy weeks (when is it not busy with two kids and a dog? ), I love keeping the fridge stocked with healthy salads we can easily grab for lunch or as a side dish with dinner. 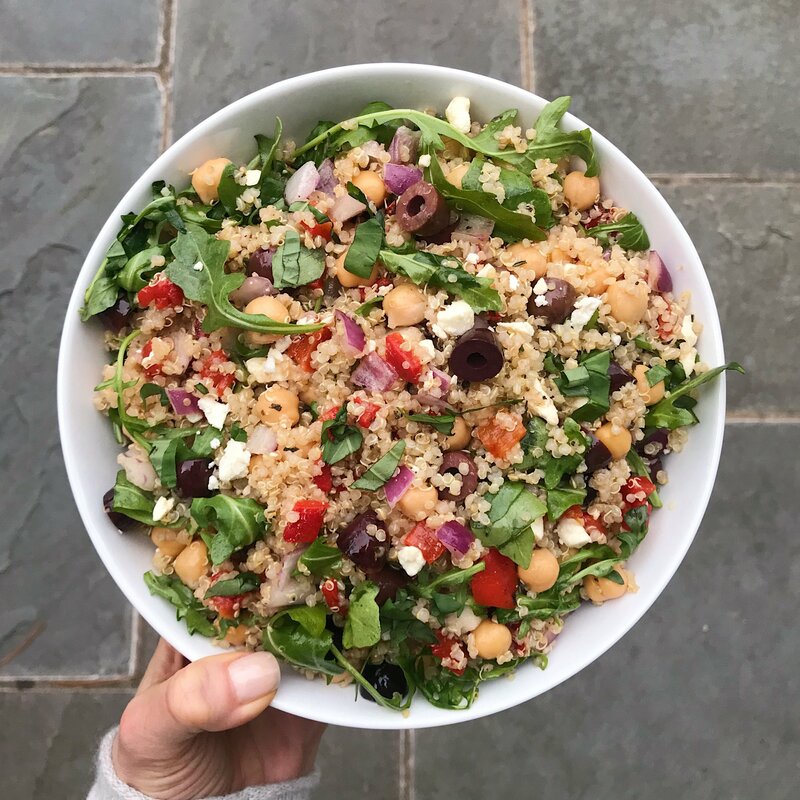 Having healthy dishes in the refrigerator makes it so much easier to eat well and stay energized when we are either racing around and have little time for lunch, or when we become suddenly ravenous! This salad is one of our go to favorites! It’s fresh, savory and packed with all the Mediterranean flavors my husband and I love so much! It was inspired by one I made from Foodie Crush last year. I made it so often, I started tweaking it and making adaptations for our tastes and preferences. The best part is that it is made with pantry staples and items we always have in our fridge so we can whip it up any time! The details …. 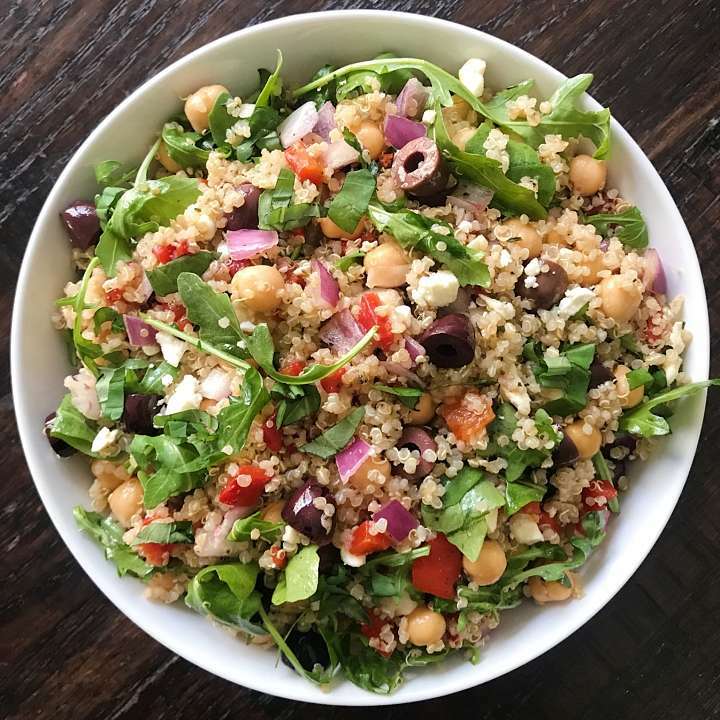 it’s quinoa, arugula, chickpeas, finely chopped roasted red peppers, kalamata olives, red onions, crumbled feta, and lots of fresh basil, tossed in a Herbed Balsamic Vinaigrette with basil and thyme. 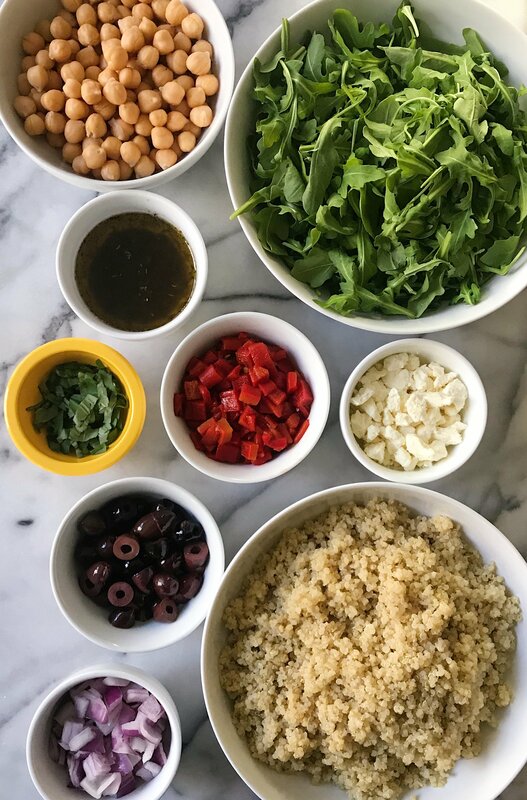 Real, whole foods and simple ingredients that come together in one delicious salad! 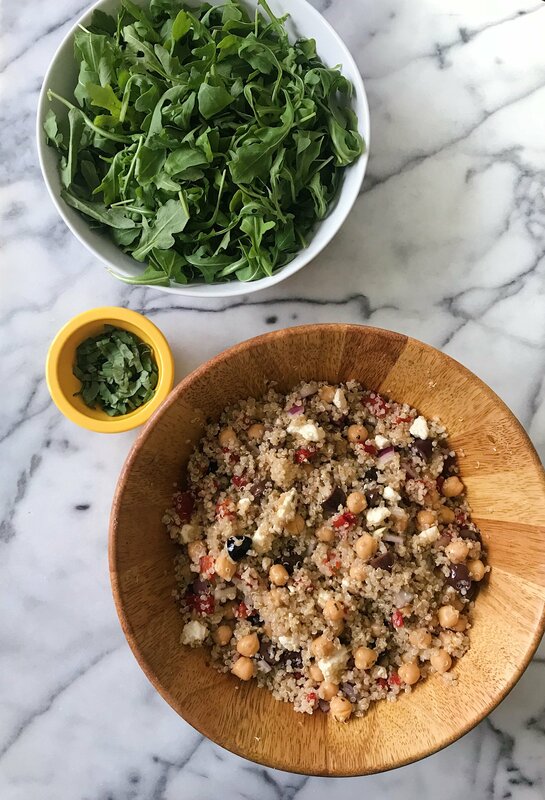 When I make this salad for meal prep (as opposed to serving at a brunch or lunch), to keep it fresh through the week, I like to mix the quinoa, veggies and vinaigrette together and keep the arugula separate until we’re actually eating so that it doesn’t wilt. This easy to prepare gluten-free and vegetarian salad is perfect as a simple lunch or as a side dish. It's savory, nourishing and delicious! Stores well for several days, especially if you keep the arugula separate and add when ready to eat. In a small to medium saucepan, add 1⅓ cups water and quinoa. Bring to a boil, reduce to simmer, cover and simmer 15 minutes or until water is absorbed. Remove from heat and let sit a few minutes then fluff with fork. Set aside. In a liquid measuring cup or small bowl whisk all ingredients until well combined. In a large bowl add cooked quinoa, all ingredients except arugula and ½ the dressing. Toss to combine. Add more dressing as desired. Toss in arugula when ready to serve. Serve cold or room temperature. Stores well in the refrigerator for several days in a sealed container (especially if you don't add the arugula until ready to eat.